DETROIT — Matt Patricia has appeared to push the Detroit Lions more than they ever were under Jim Caldwell. The Lions seemed to run more and hit more. And, they may have gotten yelled at more. On the practice field over the last several weeks, it wasn’t hard to see or hear Patricia. The burly man with a bushy beard and a pencil over his right ear moves around a lot, spending time with various position groups during drills to share his expertise on both sides of the ball. He shouts to get his point across at times, including once when he didn’t like the pace in which players were moving from one field to another. How does Patricia avoid overloading his players? And for the first time, Patricia will be an NFL head coach in a game that counts tonight in Detroit against the New York Jets. The 43-year-old Patricia declined to share his emotions entering a big day in his life, keeping people guessing, much like his mentor has done for years. He was on Bill Belichick’s staff for 14 seasons, serving as his defensive coordinator the last six years. Many years earlier, Patricia began his path to leading a team in the league by matching wits with buddies while playing electric football. Patricia, who is from Sherrill, New York, would set up miniature players on a vibrating, metal field to face off with friends in games that would continue for weeks. “I knew at a very young age the strategic part of the game was something that I just loved,” Patricia said at his hiring in February. When the Lions hired general manager Bob Quinn two-plus years ago, the former Patriots executive chose to keep Caldwell in 2016 and gave him a contract extension the next year. Quinn had his eye on Patricia over the last two years and cleared a path for them to reunite by firing Caldwell after last season’s 9-7 mark wasn’t good enough to put the team in the playoffs. 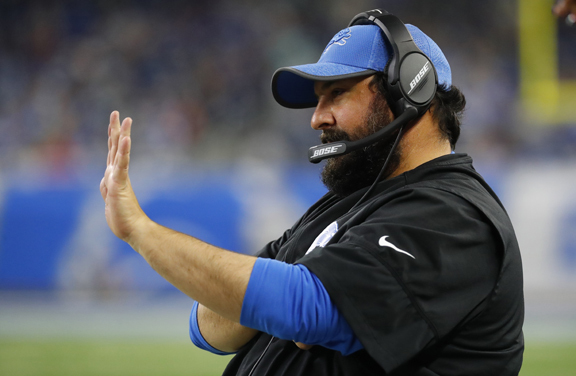 Even if Detroit got into the postseason and lost, Caldwell might’ve been replaced by Patricia.